View the training via WEBCAST (taped June 13, 2017) on your device at a place and time convenient to you. You will be emailed access instructions within 1 business day. Learn about representing clients with billing and service disputes, assisting clients facing shutoff and connecting vulnerable clients with resources. 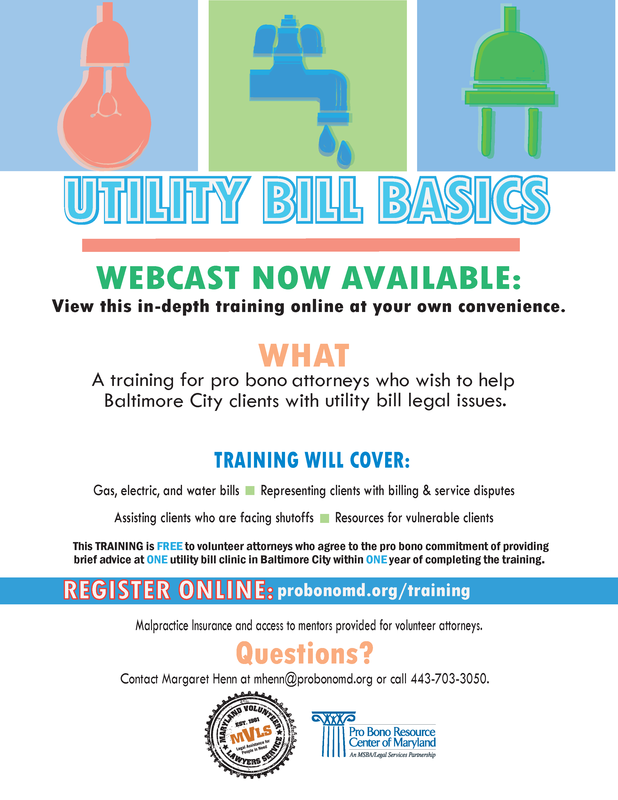 This training, offered as part of PBRC’s Home Preservation Project to attorneys eligible to practice in Maryland, covers gas, electric and water bills. Participating attorneys must agree to attend at least one “Utility Bill Clinic,” providing pro bono brief advice to clients, within one year of registration. Why volunteer at Utility Bill Basics clinic? PBRC’s Home Preservation Project Director, Margaret Henn, speaks at a press conference about the importance of water affordability programs for low income customers in Baltimore.